There’s nothing spooky or eerie about the group reading, but then, I’ve gone to these before, and, full disclosure, I’m a witch – I scare people, I don’t scare easily. The room has a sense of softness to it, with cotton-ball clouds hanging from the ceiling, tulle covering overhead fluorescent fixtures, fairy lights and sheer curtains hanging in the windows, and angels – sometimes just their wings – everywhere. A cross hangs on one wall, a colorful picture titled “Chakra” on another. In one corner is an ancestor altar. Although Kate Howe had arranged two rows of chairs at the far end of the room for a two-hour Heavenly Connections Gallery Event, we seven women who showed up settled into the cozy fabric furniture nearer the door, supplemented with relocated folding chairs. Howe smudged the space, swirling a smoldering bundle of sage around the room and followed that by striking a chime several times, allowing its vibrations to further cleanse the room. “I do energy work as I talk to you, FYI, so you might leave here with a headache, you might leave here feeling really tired. It’s because I’m moving some energy around as I connect with you,” Howe said. “I am a medium – from the day I was born. My mother would always pull out the medium in me as a child. Everybody else thought I was weird. I would talk to trees; I would talk to imaginary friends; I would speak in different dialects and my mother always nurtured that in me. My mother always said, ‘Oh, it’s just Kate talking to her angels.’ And my dad, who was very much on the other side of his brain, is, ‘You can’t tell her that.’ As a businessman, he says, ‘You can’t tell her that’s OK. People are going to think she’s crazy,’” she said as she seemed to tower above us seated in something of a circle with a wide opening for her to move about, in and out as she pleased. “When I was 21, my mother passed away from lymphoma, and I was in a very difficult place, spiritually. I didn’t know what it meant to lose a parent. I didn’t know what it meant to lose anybody … and it being my mom really tripped up my emotions, my mind, my anger, my sadness. Instead of the shaman, Sinclair was there. Howe and her father came without knowing there was a change, and decided to meet with her instead. Michael was this woman’s grandfather. Talking quickly, sometimes using her hands, she described the images she was seeing. The number was significant with her brother’s birth and passing. “He’s stepping forward. What’s the connection to Florida for you? For him? Who’s down there right now? Who’s going down there?,” Howe fired off in rapid succession. “It’s where he just came back from,” the woman acknowledged. There was no such connection. Turns out it was not the woman she was facing, but the woman in the corner whose brother was named after his father and whose son was named after her husband. An obituary, a mother-in-law who just passed, cupcakes signaling a celebration and being a control freak were among the subjects that surfaced as Howe described the images she saw, often thanking those who sent them. “Do you have a dog that just crossed,” she asked a woman. “My god,” came the reply. It was a 13-year-old Great Dane. Some images appear to connect with no one. It was a father who had side effects from medications following a kidney transplant. Questions, responses and information flowed. “Jesus! My youngest son is convinced he’s going to be on Broadway and he’s going to be a big star. He’s 13 right now,” one woman said. “So, just know that the other side might be laughing with you … but anything can happen. It’s just important to know that the other side sees little things that are happening in our life, big things that are happening in our life,” Howe said. “I’m just in the wrong area,” Howe said. The answer was affirmative, leading Howe to share a piece of her life. The “scheduler” turned out to be a nurse. A grandmother who indicated she died of a stroke wanted her granddaughter to know she sends a red cardinal every day as a sign. The session continues. Howe is compassionate and kind. For the most part, everyone remains silent but keenly attuned. Someone understood the bubble wrap reference, but no one claimed the “Price is Right” connection. “Does your grandmother have a child up there with her now? [‘Yes.’] They’re both coming in together. Do you go to a cemetery often? I feel like I’m seeing cemeteries,” Howe asked a woman. “I just stopped by my grandmother’s cemetery. I was just driving by and realized ‘this is her cemetery,’” said the woman, adding that she stopped to pay her respects. Hearing that, I felt prickles of energy touching my skin– something that happened several times that night. Then Howe turned to me. I didn’t think I did much at all, and I certainly wasn’t there as often as I wish I had been. My sister and I were born on the same day two years apart. She told me twos and hawks that sometimes swoop very close to my car are both symbols from my mother. I see both often. Howe correctly noted I was channeling fear when it came to my freedom – it’s a long story – and that the umbrella was a significant symbol for me. “I feel like it’s important for you to know that mom is acknowledging that this is the right time,” Howe said, adding my mother is glad I stopped saying, “one more year” before retiring. My sister is packing to move to a new home 125 miles away at the same time I’m packing to move 175 miles before becoming a wandering witch on wheels in an old bus converted to an RV. Not until I transcribed my recording of the session did I remember my mother had a much older half brother who died when I was very young. I’m moving to New Hampshire. Assuring me I’ll find the higher altitude to be energetically quieter, Howe went on to tell me the lion and the cheetah are both going to be my power animals to help me be fierce and learn to rule in my world. There’s a brook in front of my parking space at the condo, and another on the farm where I will soon be living. After some advice to rekindle a practice I had let fall along the wayside some years ago, she asked me who I knew who was obsessed with some old cars – my ex – and that something was leaking in my house. It’s my bathtub. It’s been dripping for more than a year. The evening continued with Howe giving each woman validation through names, events and meaningful messages channeled from loved ones on the other side – confirming their presence in our everyday lives. Howe is passionate about using her abilities to help others. 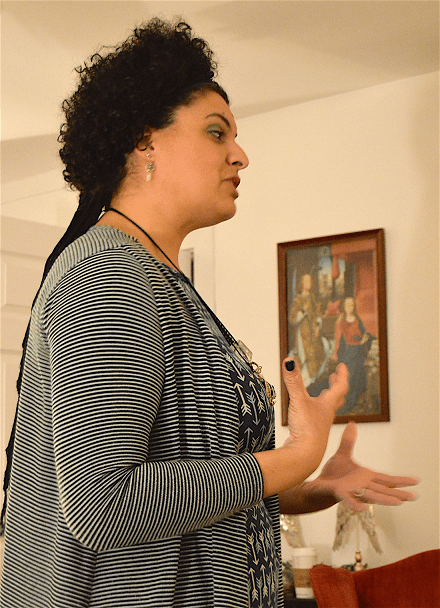 She offers a variety of classes, various types of readings and spiritual life coaching. “I’m just helping to bridge a connection we all have, helping to put language to it. I like people to leave knowing they don’t have to come to someone like me all the time to get validation that their loved ones are a part of their daily lives because we all have this beautiful connection innately within our souls,” said Howe, a resident of Salem, Connecticut who opened her office in Canton, Connecticut about two years ago. She urges those who may be experiencing an inner knowingness, mediumship, healing or other form of psychic awareness to acknowledge their gift. “What’s hard about being an empath,” Howe said, “is sometimes you know things you don’t want to know. So, learning how to deal with those kinds of intuitive hits can be very tricky. The best thing is to just honor that it’s happening and you can ask the other side for a boundary. I do that very often. I walk into crowds at a store or if I’m going out to a movie theater or a concert, before I leave my house I make it very clear to them that I am there for pleasure and that they need to be quiet. She also suggested calling on Archangel Michael for protection in that kind of situation. “I feel like a lot of empaths are just aren’t confident in what they get. They might be getting lots of hits and they don’t even know that they’re getting them, or they’re getting them and they’re very confused about what they’re getting,” Howe said. It requires putting a language to the images, words and feelings you’re getting. To work with your guides to come to build an inventory of symbols. Understanding your gift requires having an ongoing conversation with yourself and your guides. Despite what you are seeing or feeling, you need confidence that you’re not making it up, and that you’ll know when to share the information and when to remain silent. For example, if you get a vision of someone getting into a car accident, it may not mean it happens in the physical world – it may mean the person is headed in the wrong direction and is in for a rude awakening. It may mean the person is crashing energetically. Using a skeleton as an example, she said that when she sees one, it means someone has a secret. Only if she feels guided to will she share information that was not requested. The CT Medium is located in Unionville, CT. Heavenly Connections Gallery Events are held the first Friday of the month from 7-9 p.m. For more information visit thectmedium.com or call 860-924-4639. ** A large portion of this story was written for Valley LIFE and is reprinted with permission.